Hey guys, it’s Ro! Welcome to another Nerdy Nummies, I got so many requests from you guys to make something space-related. So that is exactly what we’re gonna be doing today. I dressed up as like a little galaxy picture I’m so fascinated by space I love stories and series and movies about space travel. Firefly, Star Trek, Star Wars Interstellar, The Expanse, (I’m on season 2) Guardians of the Galaxy, Passengers, anything Neil Degrasse Tyson’s ever made. The list goes on there are so many. Not only fictionally, but in real life. I follow NASA and that little Mars rover on Twitter, and I can’t get enough of that little Mars rover I just love him! So today, we’ll be making… Galaxy Cupcakes! This is in the Space chapter of the Nerdy Nummies cookbook and as you can see they’re decorated to look like the colors of the universe. Let’s get started! the chocolate cake recipe From the Nerdy Nummies cookbook makes two dozen cupcakes We’re cutting that recipe in half to make one dozen cupcakes. The things you’ll need will be 2 eggs. 1/3 cup of cocoa powder, 2/3 cup of sugar, 1/3 cup of brown sugar, 2/3 cup of all-purpose flour, 3/4 teaspoon of baking soda, 1/2 a teaspoon of baking powder, 1/4 teaspoon of salt, a quarter teaspoon of ground cinnamon, 1 teaspoon of vanilla extract, 3 tablespoons of water, 2 tablespoons of vegetable oil, and half a cup of sour cream. Now Let’s put it all together! First step to make our chocolate cupcakes: In a large bowl add your flour, cocoa powder, cinnamon Mmmmmmm salt (salty salty) Baking powder, and baking soda. Whisk together until well combined. Pour in your granulated sugar and brown sugar. Whisk together one more time. Now in a medium sized bowl whisk together two eggs, ,yolk and egg white, sour cream, -scoop it in there- oil, This is not an ingredient. Water, and vanilla extract. Whisk together until well combined. Break up those yolks! So we’ve got our wet ingredients and our dry. Now pour all of the wet into the dry. Mix together until no dry ingredients remain. Chocolate cake batter is ready, I have a cupcake tray lined with a bunch of black paper liners. Fill each cavity about two-thirds full. I’m using an ice cream scoop Cupcakes are ready to bake. Heat your oven to 325° and bake for about 18 to 20 minutes. Cupcakes have baked and had plenty of time to cool. I really like this recipe because the decorations are very simple and beautiful. To pipe these cupcakes, you’ll need a large piping bag with a star tip at the end ah~ Which is quite fitting ’cause it’s for galaxy cupcakes! The star tip, the galaxy, star, gala- Okay You also need buttercream frosting: royal blue, regal purple, electric purple, Electric pink, and black. Place two of the bright colors at the bottom of the bag, only about halfway in, leave some room to wiggle, Then place the black icing on top, then add the other two colors on top, press them all Towards the tip of the bag. They won’t go all the way down And that’s okay. That icing’s coming out one way or another. To frost the cupcakes, start piping in the middle, work your way out, and then up. Do this to the rest of your cupcakes. This is what the cupcakes look like, they almost blend in with my shirt, looking like the galaxy. Now for the final decoration step: Sprinkle a little light blue sanding sugar, make it drizzle drizzle drizzle drizzle, and silver edible stars on the top of the cupcakes. I love these little stars. Look like something you could wear on your face if you were going to Coachella in space. 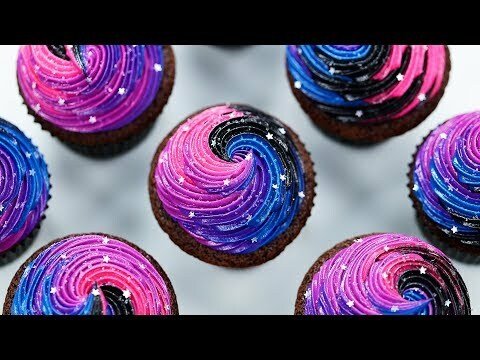 Ta-Da~ Here are the galaxy cupcakes that we made today using the chocolate cake recipe from the Nerdy Nummies cookbook. This is a really fun idea if you ever have a space themed birthday party or a viewing party for any new fun Sci-fi space movies. You can also invite me. I’m pretty much- I’d come I really love this recipe because they look so beautiful But I would say they are easy-mode to decorate. Another cool thing is you can choose any color you want I just chose some of my favorite. A big thank you to you guys for suggesting something space-related! I’ll be taking lots of pictures and posting the recipe on RosannaPansino.com, Facebook, Twitter, and Instagram. You can check it out there, and if you guys make these cupcakes, please take a picture and send it to me. I love seeing your baking creations. It just makes me happy. It makes my day. Especially when they’re space themed. That’s pretty neat. And if you have any other ideas for any other Nerdy Nummies, please let me know, leave me a comment down below, and I will do my best to make it happen. Alright, thanks again. Bye Bye! Now I get to have one for me. Which is perfect because I’ve been craving chocolate lately. Couldn’t have made these at a better time! Mmm Chocolate Mmmm. .